The United States Mint has announced the design selections for the reverse of the 2015 and 2016 Native American Dollars. The theme for the designs will be the Mohawk Ironworkers and Code Talkers of Word War I and World War II. The Native American $1 Coin Program was authorized under Public Law 110-82 and features annually rotating reverse designs celebrating the important contributions made by Native American tribes and individuals to the history and development of the United States. Since the launch of the series in 2009, themes have included the Three Sisters method of planting (2009), the Haudenosaunee or Iroquois Confederacy (2010), the Wampanoag Treaty of 1621 (2011), the spread of horse culture (2012), the Treaty with the Delawares of 1778 (2013), and native hospitality ensuring the success of the Lewis and Clark expedition (2014). 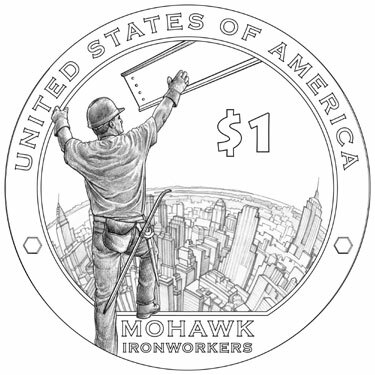 The 2015 Native American Dollar celebrates the Mohawk high iron workers as builders of New York City and other skylines from 1886. The Mohawk Ironworkers had a reputation as top notch workers who did not fear the heights or dangerous conditions on high steel. They worked on prominent landmarks within New York City such as the Empire State Building, the Chrysler Building, the George Washington Bridge, and the World Trade Center. The reverse design of the coin carries a depiction of a Mohawk iron worker reaching for an I-beam as it swings into position. A high elevation view of the city skyline appears in the background. Inscriptions include “United States of America”, “$1”, and “Mohawk Ironworkers”. The reverse was designed by Ronald D. Sanders and will be engraved by Phebe Hemphill. 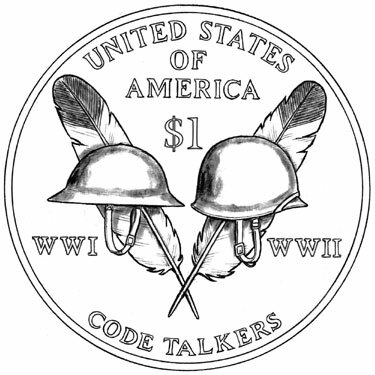 The 2016 Native American Dollar honors the Code Talkers from both World War I and World War II. The Native American Code Talkers had served in the United States Armed forces and used their tribal languages as a basis for secret communication, which proved unbreakable to enemy forces. The reverse design of the coin includes two helmets with two feathers in the background that form a “V,” symbolizing victory, unity, and the important role that Code Talkers played. The inscriptions include “United States of America”, “$1”, “WWI”, “WWII”, and “Code Talkers”. The reverse was designed by Thomas D. Rodgers, Sr. with the engraver to be determined. The obverse design for each coin will feature the design of Sacagawea and child designed by Glenna Goodacre and introduced in 2000. The obverse inscriptions include “Liberty” and “In God We Trust”. The date, mint mark, and motto “E Pluribus Unum” are incused on the edge of the coins. Is 2016 an early draft? Looks sloppy. Look at the U in United.The C in America and the A in Talkers. This would be a great article, as opposed to just good, if it would only talk about the Ironworkers – like my nephews – in the PRESENT TENSE.